Want to get the most run time out of your new golf cart batteries? 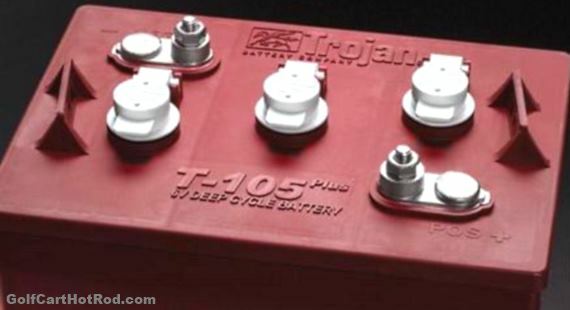 A proper break-in of the battery cells will go a long way to getting the most out of your pricey purchase. and plug back in and repeat battery charge cycle. 2. It is quite important you leave it charging until it’s completely finished! This is what you want to do 12 times. When you get to the 12th time you’ll notice a difference in power/speed and cart run time. as it can take 18 hours or more the 1st few times but as they break in you’ll notice battery charge time gets less. 4. The second most important thing is maintaining the batteries properly. A couple of times a month give the batteries and connecting cables a good cleaning. During the cleaning check to make sure all cables are secure. A loose cable can melt down battery posts in just a few minutes. Golf Cart batteries should be put on a charger even if they have been used for only a short amount of time. Even if you only take a ride over to the neighbor’s house and back plug the cart back in. The battery charger is automatic and will turn off when batteries are fully charged and ready to go. Golf Cart batteries need to keep a very precise water level to operate at their best. Low water levels can shorten their life and permanently damage the lead plates inside each cell. o Check the water level at lest once per month. o Make sure to keep the water at 1/4” to 1/2” above the lead metal plates. o Distilled Water Only! Don’t use tap water, as it has chemicals and minerals that can do damage. Low water can cause plates to over heat during a charging cycle and start a fire. o Charging batteries produce hydrogen gas. Noises like gurgling and bubbling will normally be heard. 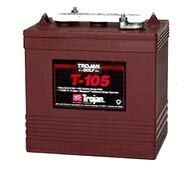 Question – I live in normally dry climate – the Trojan Batteries on my EZGO Marathon have started “seeping” fluid – making the tops of the batteries and the connections posts very moist and even dripping on the ground underneath. It seems to happen the most on those days the humidity is high or on rainy/cooler winter days of Southern California. What can I do besides keep wiping my batteries down with shop paper towels? Bruno: The wettness you are describing is the residue from the electrolite bubbeling from being charged. Sometimes the posts loose their seal and leak. You may be over charging the batteries also. Check the pack voltage one our after fully charged.